In Guardians Of The Galaxy Vol 2, our favourite galaxy-saving heroes - Peter Quill (Chris Pratt), Gamora (Zoe Saldana), Drax (Dave Bautista), Groot (voiced by Vin Diesel) and Rocket (voiced by Bradley Cooper) - return to save the day once again… accompanied, of course, by some classic tunes. 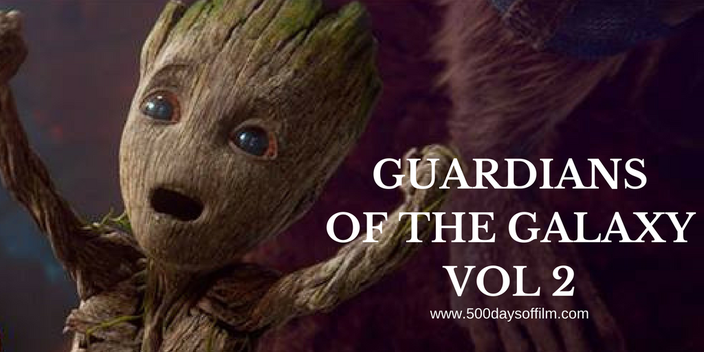 This time, however, our guardians have to deal with some rather tricky family issues. Rocket is creating chaos, Gamora’s revenge-fueled sister, Nebula (Karen Gillan), returns, and the team meet an enigmatic stranger who may help them unravel the mystery of Peter’s parentage. It seems impossible to believe that Guardians Of The Galaxy Vol 1 was expected (by some) to be Marvel’s first film flop. What did they know, right? Three years later, the movie is an absolute fan favourite with worldwide audiences eagerly anticipating the sequel. No pressure then. Inevitably, therefore, the big question is: can Guardians Of The Galaxy Vol 2 meet our high expectations and match the joyous experience of the original? The answer? Absolutely! Guardians Of The Galaxy Vol 2 (or GotGV2 for ease of typing) is a thrilling and utterly hilarious roller coaster of a ride around a neon galaxy full of glorious music and glitter. From its brilliant opening scene (Baby Groot dancing to ELO’s Mr Blue Sky while the other guardians fight a toothy monster in the background) to the film’s very (very) end*, GotGV2 is 2 hours and 16 minutes of pure unbridled fun. I loved every minute. Writer/director, James Gunn's sequel explores the guardian’s burgeoning, if unconventional family unit. In addition to Chris Pratt’s funny and charismatic, Peter Quill, Dave Bautista’s Drax and Bradley Cooper’s Rocket nail some wonderfully funny scenes. Baby Groot is, of course, cuteness personified. Meanwhile, Zoe Saldana gets to explore Gamora’s past after her violent reunion with Nebula. However, GotGV2’s plot does rather take a backseat to the film’s crazy action and comedy. If it weren’t for audience goodwill and the consistent flow of jokes and brilliant one liners, this could have proved a real problem for the movie. As it is, Guardians Of The Galaxy Vol 2 feels like an absolute blast of an after party for fans of the original film. And that is more than okay with me. *Stay until the very end of the credits to watch five extra scenes. I waited all of 13 hours to get the Guardians Of The Galaxy Vol 2 mix-tape… in my defence, I was asleep for some of those hours. Have you seen Guardians Of The Galaxy Vol 2? If you have, what did you think about James Gun’s sequel? Let me know in the comments section below!